After being hounded daily by my family to finally see a doctor I pulled out the business card for a clinic that the Fulbright Commission advised us to go to if sick – because they had good doctors, spoke English and above all accepted our insurance. There were 3 numbers on the card and 2 clinic addresses – so I began calling. No one picked up. Now, one would think that a clinic would have someone manning the phones or at least an answering machine to get calls if the office is closed for lunch, etc. But, no – not this clinic. After repeatedly calling all three numbers last Friday, I finally got through and asked in my best Bulgarian if there was someone who spoke English because I needed to make an appointment. There seemed to be a lot of confusion going on at the other end of the line and no one was able to put me in touch with a person who spoke English. So since I was being charged a whopping .34 stoltiniki (cents) a minute I hung up. Ok, time for PLAN B – I called my dear friend who speaks Bulgarian and asked if she could call the numbers to try and get me a doctor’s appointment at this clinic. So she tried calling, but by the end of the day Friday she had not gotten through to any of the numbers. So I gave up and decided to resume my attempts on Monday. When my friend finally got through, she was told that the number she dialed was not actually a clinic, but an academic center. It appears that of the 3 numbers on the card – only one is a clinic. So after not being able to get through to the clinic number again, she came over and we tried to figure out how to find the address listed on the card, while she continued calling the clinic. And she FINALLY got through – they told her we should come in, but that the address on the card is wrong and that the clinic is in Mladost-2, not Mladost-3 (which by the way are both quite far away from the Centre, where I live). This just complicated things more, because the woman did NOT give us a complete address. So we went back to the map and finally gave up. PLAN C – I had been told by many people that you can basically get anything over the counter here in Bulgaria – from heavy pain medicine to birth control. So we decided to see if I could get the antibiotics I needed at the local pharmacy. So my amazingly awesome friend and I went into the pharmacy armed with the name of my ailment written in Bulgarian on a post-it and asked for the proper medication to treat it. The Pharmacist immediately whipped out a pack of antibiotics, which he said is often used for what I had and also asked if I wanted a pack of vitamins that help in preventing it from returning. The whopping over the counter cost for these medicines/vitamins? — Only 4.50 Leva ($3.50) for the antibiotics and 2.50 Leva ($1.93) for the vitamins. The pharmacist told my friend how often I should take each and wrote it down on the box as well. Don’t worry I didn’t just immediately start taking random drugs I got from the pharmacy without looking them up first. So when I got home I looked at the vitamin box to find it was simply Vitamin B Complex and then Google searched the specific antibiotic I was given to see if it’s usually used to treat my ailment and I had very positive search results. I should be cured in 5 days – and believe me, if I’m not you’ll hear about it. 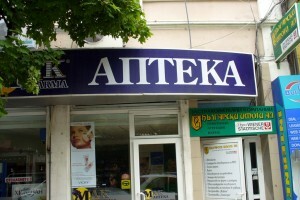 But for now it seems, unfortunately for my sister – that pharmacies have beat out the doctors in Bulgaria. Hopefully there won’t be a round two though – I don’t know if my body can take much more . . .
⟵Part II – Conquering the Balkans One Sneeze at a Time!